Through my first few years as a student at Quinnipiac I’ve learned that there aren’t many better periods of time than a college winter break. After a semester’s worth of hard work, there’s a large lull period in which students get to do something that they will most likely never be able to once immersed into ‘real life’. Have a near six-week break with virtually no obligations. Personally, I think I might be luckier than most, since I get to go home to my family (and the warmth) in Los Angeles. However, there are definitely some downsides to it too. I don’t get the chance to see many of my east coast buddies, I couldn’t experience the ‘bomb cyclone’ — OK, kind of glad I missed that one — and most importantly, I’m away from my beat with the Quinnipiac men’s ice hockey team while the team continue its on-ice operations. 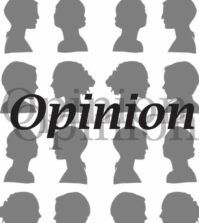 That being said, it’s been a minute since my last column. Hi, how’ve you been? At the end of 2017, Quinnipiac held a disappointing record of 6-10-2 (3-5-1 ECAC) and five games into 2018 it’s been more of the same. The Bobcats beat UConn and Colgate, fell to Cornell and Dartmouth and tied Harvard in the new year, bringing their record to 8-12-3 (4-7-2 ECAC). More than halfway (23 games) through the season, there’s no question that the Bobcats have been underwhelming, to say the least. But with 11 games remaining in the 2017-18 bid — nine of them being conference games — these next couple of months will be pivotal in what happens next for the Bobcats. But in a relatively inexplicable season of college hockey as a whole, there isn’t all that much I can do to predict the future. Something more feasible, perhaps, would be to investigate what has already happened. So with that, let’s take a look at individual performances and grade each Bobcat player up to this point of the season. Here are The Chronicle’s — actually, it’s just my — Quinnipiac men’s ice hockey post-break report cards. 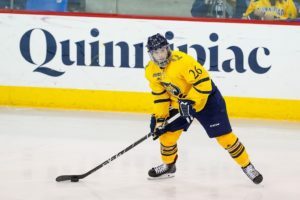 There is no doubt in anyone’s mind that freshman forward Odeen Tufto has been Quinnipiac’s best forward, if not its best player, so far this season. Through 23 games, the 5-foot-7 natural center has excelled in both 5-on-5 play on senior forward Tanner MacMaster’s wing and on the Bobcats’ first power play unit. He has five goals and 20 (!) assists, good enough for the team lead in points (25). Not to mention, his assists total leads all NCAA freshmen while he sits second in the nation to Michigan State’s Mitchell Lewandowski for freshman points. Despite a lack of blazing, high-end speed that smaller players tend to possess, Tufto’s ability to slow the game down, create space for himself with the puck, then find an open man or generate a scoring chance himself is quite thrilling to watch. He is relatively defensively responsible and isn’t afraid to throw his body around every now and then, despite his lack of size. In his first collegiate season, Tufto has undeniably been a bright spot on this struggling Quinnipiac team. A veteran amongst the Bobcats, MacMaster has not only put his two-way game on display, but has emerged as one of the more skilled forwards amongst this group this season. If there’s a game when the forward group struggles to get things going — and there has been a lot of that so far — MacMaster is usually the one to find ways to generate chances. His chemistry with Tufto has been evident so far this season and while the freshman leads the team in assists, MacMaster leads the team in goals (10), all of which impressively have come at even strength. It’s been tough for Quinnipiac to gel with just two natural centers playing down the middle, but as one of the two natural centers, MacMaster has been a solid player up front for the Bobcats, carrying and generating (along with Tufto) the majority of the team’s offense this season. This may come as a surprise to some, but sophomore defenseman (San Jose’s fifth-round pick in 2015) Karlis Cukste has arguably been Quinnipiac’s best defenseman this season. Whether it’s through his strong gap control, ability to make a first pass out of the defensive zone, being a dynamic penalty killer or consistently getting into shooting lanes, it’s clear that he’s done a great job on the blue line this year. Cukste, a bonafide defensive defenseman, quitely leads the team and sits second in the nation in blocked shots (56), however, Cukste has pitched in offensively too. He currently has three goals, eight assists and 11 points, a pace that is slated to top his freshman year totals by the end of the season. While many thought this would be the year that junior defenseman Chase Priskie (Washington’s sixth-round pick in 2016) exploded into a near-ready professional player, there hasn’t been that crazy jump this season. However, there are many contributing factors that compile into what seems like a plateau. 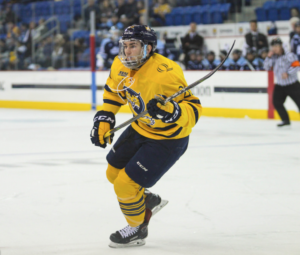 One, Priskie was thrusted into a leadership position on this team, being named the first Quinnipiac junior captain since 2010-11, in the offseason. Two, there simply isn’t as much talent surrounding him as there has been in years past. Three, this is the first season he is Quinnipiac’s true No. 1 defenseman and it takes time to adjust into that role. Despite not necessarily living up to high expectations, he is still performing at an above-average level and is arguably Quinnipiac’s best defenseman this season as well. He’s been solid defensively, but really shines when he has the puck. There are always at least one or two moments in any given game in which Priskie will rush coast-to-coast with ease, essentially making himself a one-man breakout machine. That’s valuable. Additionally, he has been the Bobcats’ backbone on the power play, scoring four of its 11 total goals on the man-advantage this season. It’s tough to be sophomore goalie Andrew Shortridge this season. From the get-go, competing against Keith Petruzzelli — essentially labeled a freshman phenom — for the starting job, then taking it and running with it isn’t easy to do. Playing behind, what was supposed to be an absolutely lights-out d-corp that hasn’t nearly met its expectations, is pretty difficult too. On top of that, the pressure of backstopping a team that puts up, on average, 36.4 shots on goal a night, but also can’t seem to score is a lot. To keep it short and simple, he’s handled everything quite well. In 19 games played, Shortridge has posted a .908 — which is better than it appears, due to the sample size of Quinnipiac’s limited shots against per game — and a T-2nd nationally shutouts total (4). Like all goalies, there are moments that Shortridge would like to have back, but he has been relatively stellar this season and has kept his team in games at times as well. As Quinnipiac’s starter for the majority of the season, he has carried himself well and backs up his status with solid play in the crease. A reliable defenseman goes unnoticed in games and that is typical of junior defenseman John Furgele’s play this season. 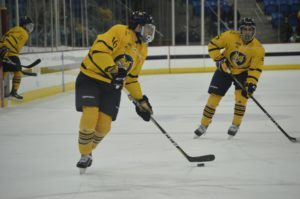 After sitting out last season following his transfer from New Hampshire, Furgele brings a noticeable calm demeanor and veteran savviness to the Bobcats’ blue line. He goes unnoticed most games because he seldom makes mistakes. That’s a positive. His gap control is solid, he makes a clean first pass and stays out of the penalty box (6 PIM in 23 GP). When he is noticeable, it’s usually due to getting down to block a shot or making a smart offensive play. His ability to buy-in to head coach Rand Pecknold’s system is evident, supported by his assistant captain status as of Dec. 28. As a natural defenseman it’s hard adjusting to a full-time forward, especially when your first crack at it comes at the Division I collegiate level. For junior Luke Shiplo, that is exactly what has happened this past season. Shiplo essentially never played consistently at forward in his entire hockey career until this year’s stacked Quinnipiac blue line was in full tact. It forced him out of his regular position, but Shiplo is too valuable to scratch. So the small, speedy and chippy d-man plays forward most games, but is one of few hybrids on this team that can play both up front and at the back end. It’s clear Shiplo’s comfort levels at forward aren’t the same as when he was playing defense, but he is making the most of his time as a bottom-six forward (third on the team in plus-minus with a +5 rating) and surely deserves credit for the tough task at hand. Hockey fans of all kind love to see a guy go out there and create chaos. They love a player like that even more when he chips in offensively. 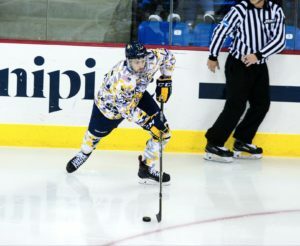 After a freshman season in which he established himself as one of those gritty players — most notably from his 21 penalty minutes in six games — sophomore forward Logan Mick has earned a full-time spot in Quinnipiac’s bottom-six about a quarter ways into the season and is making the most of it. He has three goals and one assist (already doubling his point totals from last season) in 13 games played, but brings much-needed fire to every contest he’s a part of. Whether it’s finishing every hit he can, sacrificing his body to block a shot or even generating an occasional scoring chance, Mick plays with his heart on his sleeve and has fit in to his bottom-six role really nicely this season. When you’re the second-highest drafted player to come into a fairly new Division I program, there are going to be expectations whether you like it or not. But freshman goalie Keith Petruzzelli has dealt with and battled through those expectations in a different way than other dubbed-star freshmen. He hasn’t been playing all that much and seems as though he is being eased into a starting role on this team based on Shortridge’s 18 starts and Petruzzelli’s mere five. His raw stats (.878 save percentage and 3.51 goals against average) do not reflect the way Petruzzelli has performed this season at all. Although he’s only started in five games, three of those have been against Hockey East opponents, one against a highly-skilled Harvard team and the other against RPI on the road. There’s no doubt he’s a work in progress, but with more games under his belt, it will be more clear how valuable Petruzzelli will be to this Quinnipiac program for years to come. After sophomore forward Alex Whelan jumped to a ridiculously hot start to the 2017-18 campaign, scoring four goals in his first five games, his production has cooled off considerably since. His shot production is unbelievable this season (first in the nation in shots on goal for with 113 in 23 games), but the ability to score consistently score has been lacking. While Whelan’s nine goals this season rank second amongst Bobcats this season, it often seems as though he shoots just to shoot because it worked for him early on in the season. The bottom line on Whelan so far, is that he’s clearly is a young player still developing within a fairly new role at the collegiate level. He plays like a puppy on the ice, in the sense that he never stops moving his feet, plays a pretty physical game and is trigger happy with the puck on his stick. His patience with the puck will come as he matures into an upperclassmen, but for now — like so many others on this Quinnipiac team — Whelan remains a work in progress. One of two original captains on the 2017-18 Bobcats, senior defenseman Kevin McKernan has been solid this season. He’s a defensive defenseman that possesses the ability to jump into play when he wants to, but due to the lack of talent surrounding him relative to years past, he’s had trouble, like other upperclassmen on the team, adjusting. Similar to Furgele, McKernan goes unnoticed in a positive way most nights, but when he is in the spotlight it’s due to one of two reasons. The first is, whether it’s through a clean zone entry or a calculated effort to keep the puck in the offensive zone, his ability to make things happen offensively. The second is a negative in taking penalties. McKernan is on pace to set a career high in penalty minutes this season (20 PIM in 23 GP so far) and it’s largely due to his aggressive style of play. His almost bland, yet chippy style of play is working for the Bobcats this season, but again, it’s tough to adjust to a less talented team especially coming from a high-end 2014-15 or 2015-16 team that McKernan was a part of. When sophomore defenseman Brogan Rafferty came onto the scene last season as a freshman, it frankly brought shades of Chase Priskie’s freshman season. Rafferty was a relatively unknown name, — albeit a name like Brogan Rafferty definitely grabs your attention — a right-handed shot that possessed major offensive upside and a first-year defenseman that was actually backing up his raw skill with numbers on the scoresheet. While he has rebounded from a rough individual end to last season, Rafferty has been a consistent member of Quinnipiac’s stellar blue line. He’s a valuable asset on the Bobcats’ first power play unit, can really move the puck North-South with ease and despite slight lapses in his own zone, he has played relatively up to par defensively. To put it simply, Rafferty has been a very solid offensive defenseman for Quinnipiac this season. After making a name for himself as a freshman that can play a physical game, yet contribute consistent offense in 2015-16, junior forward Scott Davidson has been getting back on track this season after not scoring all of his sophomore campaign. He broke the long goalless drought on Dec. 8 against Maine which could finally take some weight off of his shoulders and let him focus back on his natural get-in-your-face type of game. With one goal and five assists on the season (just two away from his point total last year), it’s indisputable that Davidson gives more to this team than just offense. Although he generates a decent amount of offensive opportunities for a bottom-six player, the Bobcats don’t necessarily rely on Davidson in that regard because his value is certainly seen through his character, ability to consistently play with an edge and most importantly be flexible. With not much depth down the middle this year, Davidson, a natural winger, has been playing center the majority of the season and that’s impressive in itself. 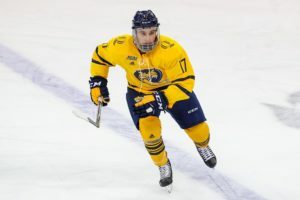 It my be slightly premature, but it seems as though Quinnipiac was counting on sophomore Nick Jermain to have a breakout season and emerge as major contributor within its top-six this season. While Jermain is on the right trajectory to success (0.231 points per game in 2016-17 and 0.391 points per game this season), he hasn’t necessarily gelled with any consistent linemates up to this point. Arguably, his best couple of games came when senior forward Landon Smith was hurt against both Dartmouth and Harvard, so Jermain slotted into Tufto and MacMaster’s line picking up three assists in the process. Might have the expectations been a bit too high on Jermain coming into the season? Probably. He’s still in midst of developing into a solid offensive weapon for the Bobcats. But more desperation and offensive production in his overall game would be nice to see from him moving forward. While Jermain had too much expectation coming into this season, freshman forward Devin Moore had quite the opposite. Listed at 5-foot-7 and just 145 pounds, the diminutive winger has seen more ice time than most may have originally thought. That being said, it’s through a fourth-line role on a game-to-game basis and he’s had trouble creating much of anything during that time. It’s not as easy to step into Division I college hockey as a freshman as it is to be a rookie in any league within the CHL because you’re essentially playing grown men rather than younger players. The age limit in Junior A hockey spans from 16-21 while a typical NCAA freshman will usually begins his career at 21 years old. Moore has no goals and one assist in 12 games this season, but it’s been a nice opportunity for him to see what Division I competition is like this season. Coming into Quinnipiac this season, freshman forward Matt Forchuk was looked at to be one of a few freshmen to make an instant impact. He captained his Canmore Eagles and led all Alberta Junior Hockey League scorers with 97 points in 56 games — mind you, he also totaled 100 penalty minutes in that time — in 2016-17. While the jump from junior hockey to college hockey is sizeable, you would expect those numbers to translate a little more than just one goal and three assists through 17 games played. While he doesn’t play a ton of minutes for the Bobcats, there are times when it’s tough to notice Forchuk out on the ice at all. Whether it’s taking more time to get acclimated to Pecknold’s systems or simply just adjusting to the NCAA-style of play, something isn’t clicking for Forchuk and there is definitely more to give from him moving forward. While senior Kevin Duane sat out in his transfer year during Quinnipiac’s national championship run in 2015-16, there were hopes that the 6-foot-5, former Boston University Terrier would help fill in holes for important players leaving. With just 13 points in 29 games last season and now just three points in 23 games this season, Duane has had a rough go in the ECAC so far. He plays every night because he is one of two natural centers that plays down the middle on this team, but he hasn’t been all that effective with a series of wingers skating with him (most recently Whelan and senior forward Bo Pieper). He has taken the second-most penalties on the team (15) and just barely cracks .500 in the faceoff circle despite taking the second-most draws on the team (175 wins and 173 losses in 348 attempts). Duane’s lack of goal scoring this season is one of the many contributing factors as to why Quinnipiac has had trouble putting pucks in the back of the net as a whole. While Landon Smith sits fourth amongst Quinnipiac’s leading point-getters this season, his five goals and seven assists in 20 games, from a player that posted incredible numbers his first couple of seasons as a Bobcat, isn’t great. His offensive production was at its best when playing with two highly-skilled players (Sam Anas and Travis St. Denis), but it has noticeably dipped since their respective departures. There are glimpses of his high-end offensive skill, but overall, he hasn’t been able to get it done with a lack of talent surrounding him. Even when he does score (three goals against No. 52 Pairwise rated Brown), it isn’t necessarily at big-time moments. This relatively young Bobcats team needs a player like this to step up this year, however, his scoring abilities and will to generate consistent offensive opportunities have definitely been disappointing. One of four seniors on this Quinnipiac team, it seemed as though forward Bo Pieper was poised for a stellar season in 2017-18 after 2016-17 saw a breakout year (13 goals, 12 assists and T-4th on the team in scoring) from the feisty winger. Unfortunately for Quinnipiac, Pieper has been one of those many forwards that just hasn’t been able to be consistent on a game-to-game basis. While he has six goals and four assists through 23 games so far, just five of those points (four goals and one assist) have come at even strength play. He’s been a solid asset on both the power play and penalty kill units, but when you’re playing the majority of your ice time at 5-on-5, there has to be a more steady sense of offensive production from Pieper as the season progresses. Similar to Pieper, junior forward Craig Martin had a real breakout season in 2016-17. His 11 goals and 16 assists in 40 games was good enough to be second in team point-scoring and coming into 2017-18, there would surely be more of the same. However, Martin has struggled to find his groove, recording just three goals, four assists and a team-worst -13 rating so far. That being said, it’s important to note that the natural winger was tested at center for a good portion of the beginning of the season as well. It could be a mental lapse that he has to get over, maybe it’s the pressure of being an upperclassmen on a pretty young team or it might just simply be that he’s just be gripping his stick too tight in search of some offense. Whatever it may be in Martin’s case, if Quinnipiac wants to correct it’s inability to score as a team, it starts with one player then trickles down onto the rest. Especially with the recent departure of Thomas Aldworth, players like Martin, Pieper, etc. have to find their scoring touch that was once a big part of their respective past games. Another player that may have simply had too high of expectations coming into the season is junior Brandon Fortunato. The former BU Terrier, and member of both the U.S. National Development Team and the stacked 2016 U.S. World Junior team — featured members including Auston Matthews, Zach Werenski, Matthew Tkachuk and Brock Boeser to name a few — hasn’t been able to find his game with Quinnipiac. Maybe it’s just a matter of finding his legs after sitting out 2016-17 in his transfer season or adjusting to Pecknold’s “buy-in,” but Fortunato isn’t the same crafty defenseman that showcased his talents in the 2015 National Championship with Boston University. Whatever it may be, as an offensive defenseman, it isn’t good enough to record just one goal and one assist through 22 games this season, especially when the defensive game isn’t as sharp as other blueliners. There has to be an offensive compensation for that and right now, and while there are small glimpses of what he could be, Fortunato hasn’t shown it yet. If you’ve made it this far into the article, thanks for sticking through this long read into individual Bobcat performances up to this point of the season. I’ll be back for both of the men’s ice hockey team’s games on Friday and Saturday, when I travel to Arizona State for Quinnipiac’s weekend series against the Sun Devils (shameless plug to follow me on Twitter @justin_cait). It’s been a nice break, but as you can hopefully tell, I’m eager to get back at it.